Throughout history, jewelry has been used to communicate one’s status: royalty wear crowns and have designated ‘crown jewels’ for formal occasions, and those who are married wear wedding bands to convey their marital status to the public. Jewelry is one of the oldest forms of body adornment. The first pieces of jewelry were made from natural materials, such as wood, bone shards, animal teeth, and carved stone. As labor practices and technologies developed, jewelry soon became showpieces of precious metals such as gold and silver, with gems mined from the ground of mineral-rich areas. Today’s jewelry is classified depending on the materials it contains. The first defining element is the metal used in the piece. Gold, platinum and silver are considered precious metals and will command a higher price than non-precious metals, such as copper, brass, or titanium. The second major component of estate jewelry is the gemstones that might be present. The gems that are most sought after are diamonds, emeralds, sapphires, and rubies. While still very beautiful, opals, lapis, aquamarines and topaz bring in slightly lower values on the whole. When discussing estate jewelry, it is common for owners to not know exactly how old a piece is – just that it has been in the family for several generations! Fortunately, there are some things a professional jeweler like Gray and Sons will look for when appraising your estate piece. Before the turn of the nineteenth century, craftsmen who were members of guilds made jewelry in Europe. Guilds were formed among skilled tradesmen as a way of verifying to the buying public the authenticity and quality of their pieces. Jewelry made by these guild craftsmen bears a hallmark, or imprint, of a symbol of a specific maker or guild. Therefore, the presence of such a mark can indicate that your piece is an antique. However, pieces of jewelry need not be antiques to fetch a worthwhile price. Major jewelers of the modern age such as Cartier, Tiffany, Van Cleef and Arpels designed pieces in their heyday that are considered collectors items today and are sought after by well-heeled collectors. Pieces by modern designers such as David Yurman and Lagos are still very desirable, especially before major holidays like Valentine’s Day and Mother’s Day. In addition, the market value of jewelry rises and falls depending on whether your piece is currently on-trend or not. Also, the uniqueness of the piece in question will add to its value, because there is only one such item to be had for miles. Finally, the condition of the piece can certainly have an effect on its price, especially if the piece needs repair. Coconut Grove was only settled by permanent residents before the turn of the 20th century by British settlers tempted into Florida by the generous land grants being offered to settlers. The Monroe and Peacock families were the first permanent settlers. Coconut Grove attracted a variety of residents, from creatives to titled nobility to upstart farmers. When the railroad was built to pass through ‘The Grove’ as locals soon called it, hundreds of new residents came through Coconut Grove on their way to Miami. Coconut Grove, with its beautiful beaches, developed ‘millionaires row’, with palatial homes owned by William Deering and David Fairchild, among others. Today, while Coconut Grove still houses a flourishing creative and artistic community, there are also the modern amenities of highly desirable areas such as luxury condominiums and boutique shopping. For the jewelry owner considering selling in Coconut Grove, this means an appreciative market of those who appreciate fine design. Owning a piece of estate jewelry is a link to your heritage, certainly, but often these pieces end up languishing in jewelry boxes, collecting dust. Why not sell it to those who buy used estate jewelry and convert your treasure into cash? 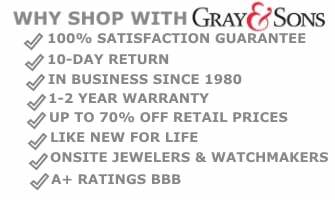 Consider expert jewelers like Gray and Sons. Jewelers like Gray and Sons know everything there is to know about how to sell estate jewelry for the highest return. This method takes a little more time, but the jeweler typically has a customer base that understands the worth of your piece and isn’t going to balk at the price. Also, the jeweler wants the highest sell price also, so both of you have a common goal. Sometimes, the appraisal value on a piece of jewelry differs from the price someone is willing to pay you for it. ‘Appraisal value’ is a term often used by insurance companies to describe how much you are entitled to if their policy must cover the loss of your jewelry. The purchase price can vary widely depending on several factors: famous brand names add value to a piece, as does fashionable design. Also, the best times to sell your jewelry are just before holidays like Valentine’s Day, Mother’s Day and Christmas. 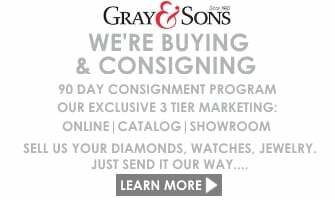 Sell your estate Jewelry to Gray and Sons, Coconut Grove! Gray and Sons routinely gets owners the very best prices on pre-owned designer pieces by Rolex, Cartier, and Bvlgari. They know quality pieces from antiques through modern design, and will make a stunning display of your piece as well. Ask your most fashionable friends, and they will tell you that Gray and Sons handles their jewelry consignments privately and efficiently. Gray and Sons’ showroom is located just across the street from the renowned Bal Harbour shops, and for Coconut Grove residents, that’s just a hop, skip and a jump away – you’re welcome to stop by whenever you are in the area.